The Inaugural Awards for Outstanding Postdoctoral Mentor and Outstanding Postdoctoral Supervisor were presented at the 2013 Postdoctoral Research and Career Symposium. Lessons learned are an integral part of the scientific process at Argonne—from working safely to process improvement. As this was the first awards program for Postdoctoral mentors and supervisors, there are many great lessons learned from postdocs being pace setters for employee recognition, eliminating bias from selection processes and in their own words, what qualities comprise a good postdoctoral mentor or supervisor. The Postdoctoral Society of Argonne (PSA) spearheaded an initiative to propose and garner support for the awards, outline the criteria for eligibility, and define the nomination and selection processes. The PSA mentoring committee, led by Laura Zamboni (MCS) and Diego Fazi (CSE) made the case for establishing the awards program as a way to recognize and foster good mentoring practices at the laboratory. With support from the Office of the Director and the Postdoctoral Program Office, a call for nominations was launched in August. Postdocs could nominate their direct supervisor for the Outstanding Postdoctoral Supervisor Award or a third-party mentor for the Outstanding Postdoctoral Mentor Award. The selection criteria recognized the nuances between supervisors and other mentors and reflect the qualities that postdocs seek in trusted advisors. Nominators were asked to rate their nominees on the above criteria and then write a narrative further detailing how the nominee meets the criteria. A committee consisting of representatives from OTD, PSA, CEPA and programmatic divisions reviewed the nominations in a truly blind process. Each nomination was “scrubbed” of any identifying information—names, gender pronouns, references to home division with the intention to eliminate implicit bias to the greatest possible extent. During the review discussions, the committee even used a closed-eye voting process for final voting! The awardees were recognized at a special plenary session of the 2013 Postdoctoral Research and Career Symposium. 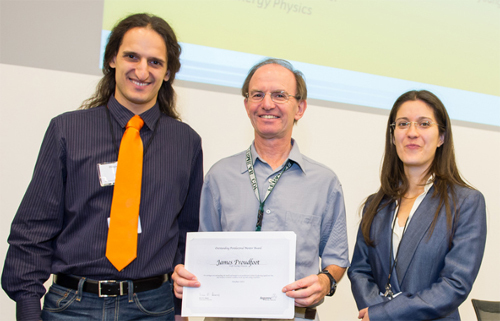 Jimmy Proudfoot received the award for Outstanding Postdoctoral Mentor and Cristina Negri (ES) received special recognition by the committee as an honorable mention. While initially left speechless, Jimmy was able to convey how proud he was to receive this recognition—which came directly from his postdoctoral mentees. 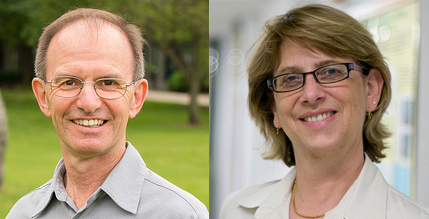 Read the 2013 Outstanding Postdoctoral Mentor and Outstanding Postdoctoral Supervisor Awards article. The narratives provide by nominating postdocs, including those of all the other nominees, provide a snapshot of the attributes of good supervisors and mentors. They demonstrate how a strong mentoring philosophy will bolster postdocs to the next stage of their careers. The testimonies also provide examples of sound mentoring and supervisory practices from which we can all learn. We will continue to share these examples in future posts to inspire a mentoring culture at the lab. You can view the presentation from the awards ceremony here. The lab seeks to build off the momentum set by the PSA and expand the mentor awards to other staff levels. From the Winter 2013/2014 Edition of the Postdoctoral Journal. This entry was posted in Announcements, Mentoring, Postdoc Awards and tagged mentor, mentoring, outstanding, postdoc awards, supervisor. Bookmark the permalink.